Gearhart Aussies believe in puppies being reared properly. Litters are born and nurtured in our home. We spend a lot of time, during the first eight weeks, handling and exposing puppies to different stimuli, new experiences and people. Our puppies are socialized, current on vaccinations, de-wormed and checked for genetic defects before they go to their new homes. We offer health guarantees and references of satisfied puppy purchasers. We take the same care in placing our puppies in pet homes as we do in competition homes. 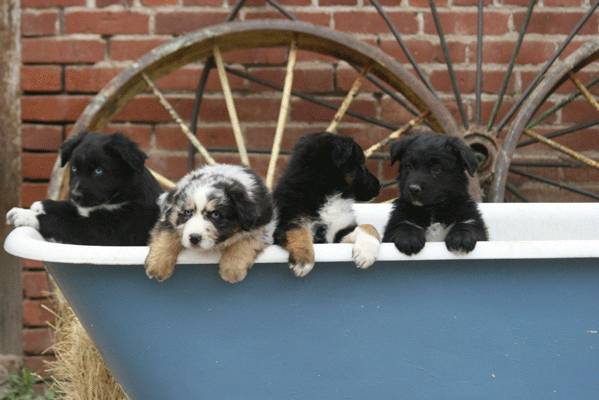 Our pups are versatile and make livable loyal companions; and compete in obedience, conformation, agility and herding. Dogs are a lifetime commitment. We thank you for considering our litters and if you are interested in providing a loving, committed home for a Gearhart pup, read the "Health Guarantee" "Puppy Placement Policy" and fill out the "Puppy Placement Questionaire"
Also check our "Planned Litters Page" and "Available Adults or Younger Dogs"
Pedigree combines Mistretta/Gearhart dogs, long passed, with close up lineage difficult to find. This is a repeat litter with puppy references available. We expect fantastic color, health, positive temperament, smart, and athletic individuals. Performance or companion. AKC and ASCA registered. Pups, via parentage, are normal/clear of CEA, MDR1, DM, HSF4, prcd/PRA. Sire is OFA Excellent and dam is OFA Good. No doubt these pups are “one of a kind” and will excel in competition.